Highly visible on the international scene during the silent film era, Danish cinema is once again generating interest at home and abroad. This renewed visibility is increasingly cited as evidence of a ‘second golden age’ of Danish film and helps in many ways to motivate Jack Stevenson’s discussion of the most significant of contemporary Danish filmmakers, Lars von Trier. It is by no means an easy task to understand the current momentum of Danish cinema or the confluence of factors that has allowed this minor cinema to overcome the problems of international access by which it was crippled for decades and that are an almost natural corollary of small nation status. A full account would have to encompass key changes in the institutional landscape of Danish filmmaking, the implications, for example, of the various Film Acts, the role of the Danish Film Institute and function of the Danish Film School. The relevant narrative would also have to evoke the contributions of a number of key filmmakers whose early successes helped to spark a more widespread international recognition for Danish film. In this regard Bille August and Gabriel Axel, who won Oscars for Pelle the Conqueror (1987) and Babette’s Feast (1987) respectively, would be obvious candidates for discussion. Yet, it is Lars von Trier, once the maverick enfant terrible of Danish film, who deserves the most focused attention, for his continued presence in, and commitment to, the Danish film milieu have been decisive. Whereas August used his international breakthrough to launch a career in Hollywood, von Trier has opted to remain in what he, in a brief statement at Cannes when Dancer in the Dark was awarded the Palme d’Or, somewhat disarmingly referred to as ‘little Denmark’. Von Trier’s firm decision to pursue filmmaking in Denmark has led to a creative, and genuinely infectious engagement with the problems and challenges of artistic production in the context of a small nation-state. Lars von Trier, as Stevenson rightly notes, “is the best-known Danish cultural export since Victor Borge” (1), but he is also a facilitator and instigator, a figure whose dynamic presence releases rather than blocks the creativity of others. In this respect, von Trier is often contrasted favorably with Ingmar Bergman, who is believed by many contemporary Danish filmmakers to have had a truly stifling effect on Swedish film. Although von Trier is now widely held effectively to symbolize Denmark’s preferred understanding of itself as a “nation of culture”, broad recognition for this filmmaker’s persona on a national level dates only from the mid-’90s. More specifically, it is the TV series, The Kingdom (1994) and The Kingdom II (1997), rather than von Trier’s early features, which established him as a central filmmaker in the popular indigenous imagination. As Stevenson points out, von Trier’s transformation in the popular mind had a great deal to do with his decision to cast well known and much loved Danish actors in key roles (80). The clear influence of popular American TV series such as Homicide and N.Y.P.D. Blue (82) no doubt also helps to explain von Trier’s Danish breakthrough with The Kingdom. If Danish audiences were slow to embrace von Trier, preferring in many ways the more conventional persona and films of a Bille August, the same cannot be said of international audiences. In this connection it is worth noting that von Trier’s first feature, the haunting and oneiric film noir entitled The Element of Crime (1984), won the Prix Technique at Cannes in 1984. That von Trier was disappointed by this prize is an established fact, but Stevenson, who has a fine sense for anecdotal recounting, includes some intriguing new details in his account of the drama of recognition. The Element of Crime failed to win the Palme d’Or, Stevenson notes, because Dirk Bogarde so “despised” the film “that he threatened to walk out of the jury” (39) if this body were to grant von Trier the coveted award. Von Trier, it is claimed, discovered this when he, full of admiration for the actor and former jury member, contacted Bogarde about a role in his third feature film, Europa (1992). The Element of Crime won von Trier the unwavering support of Festival organizer, Gilles Jacob, who helped to ensure the filmmaker’s regular presence at Cannes. International recognition significantly intensified with Breaking the Waves (1996), the first film in the so-called ‘Golden Hearted trilogy’, which also includes the Dogme film The Idiots (1998) and the musical Dancer in the Dark (2000). Von Trier’s role as the co-instigator, with the younger Thomas Vinterberg, of the manifesto-based movement known as Dogme 95 further cemented his presence on the national and international scenes. The project, announced with great fanfare at a conference in Paris in 1995, was almost stillborn as a result of conflict between the Ministry of Culture and the Danish Film Institute, but went on nonetheless to generate a genuinely global cinematic movement with implications for other fields of artistic production and for the study of globalization as a phenomenon (Hjort and MacKenzie 2003). Whatever the ultimate verdict on Dogme may be–and it has its critics–von Trier’s initiative marks a decisive turn in his career towards collectivism, towards undertakings with the potential to function as engines of innovation and renewal on various levels, be they national or international. Von Trier’s well-established profile as a filmmaker of genuine significance with a certain popular appeal has yet to be matched by an appropriate critical literature in English. 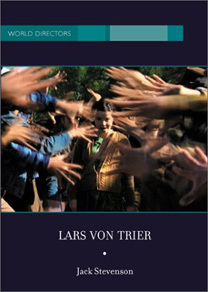 Peter Schepelern’s Lars von Triers Elementer – En filminstruktørs arbejde (1997) and the significantly revised second edition, entitled Lars von Triers film – Tvang og befrielse (2000), make the central facts and relevant analyses available to Scandinavian readers, but can have no genuine international impact. In this kind of context a study such as Stevenson’s is particularly welcome. Stevenson’s well-founded premise is that his hybrid identity as a foreigner residing in Denmark makes him a natural mediator and enables him to tell a story about von Trier that draws on sources unavailable to international readers and that also departs from the more official Danish narratives in English that aim at international audiences. Stevenson is right to point out that these English narratives, produced largely by the Danish Film Institute and von Trier’s production company, Zentropa, tend, understandably enough, to produce a rather incomplete and overly ‘official’ picture of the filmmaker’s oeuvre and artistic vision. Stevenson’s intent, then, is to situate von Trier in the context of certain cultural specificities that are particularly noticeable to outsiders, and to draw on some of the informally and unintentionally ‘censored’ discourses (especially those generated by the popular press) that reflect the dynamics of the filmmaker’s diverse roles and personae in the national context. The plot unfolds as a crime story with a mystical core: Detective Fisher, a European expatriate who has lived in Cairo for well over a decade, returns to Europe “sometime in the near future”. He has come back to help solve a difficult case–the sexual murder of a small girl. The Europe he finds is a decayed and rain-swept ruin, a place of gloom and perpetual night. In his quest to find the killer, he employs the radical psychological methods mapped out in the book The Element of Crime, which was penned by his old teacher, Osborne. Fisher must immerse himself totally in the psyche of the suspected serial killer, Harry Grey, in order to solve the crime, but he gets sucked in too deeply, with horrifying consequences and a horrifying revelation about who Harry Grey really is (33). The outcome is withheld in a gesture that recalls the strategies of film reviewers and distributors rather than critics. What is more, there is no mention here of the fact that the remarkable quality of the film’s images reflects Fisher’s role as a narrator under hypnosis. This lacuna becomes all the more curious when one recalls the importance that von Trier attributes to hypnosis for understanding the workings of the cinematic image. Stevenson, it should be noted, does comment on the role played by hypnosis in Epidemic and Europa, but fails to draw attention to the similarly striking mode of narration adopted in the trilogy’s first film. Overall, though, the fine balance between competent film scholarship and telling anecdote makes Lars von Trier an engaging and informative read. While many of the relevant stories have been told and re-told in the popular Danish press, few have made their away into English. There is certainly no English-language publication that gathers these narratives together to construct a compelling picture of the personal passions and histories that drive von Trier as a filmmaker. Von Trier’s obsession with rules may well, for example, take on new meaning for international audiences once they have had the occasion to ponder the apparently distressing effect of growing up in a household so liberal that rules of any kind were considered ideologically suspect. In a sense Stevenson’s project is a matter of translating the Danish legend surrounding von Trier into a language that is more widely understood. Stevenson touches on all of the key elements in this legendary discourse, examples being Lars Trier’s provocative appropriation of the aristocratic ‘von’ and his mother’s stunningly worded confession on her deathbed to an affair that made Lars the son of a Protestant bureaucrat with the ‘right’ kind of artistic genes, rather than of the left-leaning Ulf Trier whose Jewish heritage had significantly shaped the filmmaker’s sense of self. Von Trier’s tempestuous relation to the Icelandic singer, Björk, is also evoked in some detail, a choice of emphasis that is amply justified by the rather far-reaching effects that conflicts between the filmmaker and singer had on the work that we now know as Dancer in the Dark. In sum, Lars von Trier is a well-informed and well-written book on a significant filmmaker. Readers who have been privy to the Danish discussions will find nothing new here, but then they are in no wise part of the book’s target audience. International audiences, on the other hand, can look forward to a highly readable story about the life experiences and driving concerns that inform the oeuvre of the filmmaker von Trier. Mette Hjort teaches in the Department of Comparative Literature at the University of Hong Kong and the Department of Languages and Intercultural Studies at Aalborg University. She is the author of The Strategy of Letters (Harvard UP) and, with Ib Bondebjerg, of The Danish Directors: Dialogues on a Contemporary National Cinema (Intellect Press). She is editor of Rules and Conventions (Johns Hopkins UP) and co-editor of Emotion and the Arts (Oxford UP), Cinema and Nation (Routledge), and The Postnational Self (U of Minnesota P). A co-edited volume on Dogme 95, entitled Purity and Provocation: Dogme 95 is forthcoming (BFI).